The most complete, up-to-date source of information for Solaris administrators, covering all versions. This guide gets to the core of the most common problems encountered by sys administrators and shows you how to solve them. 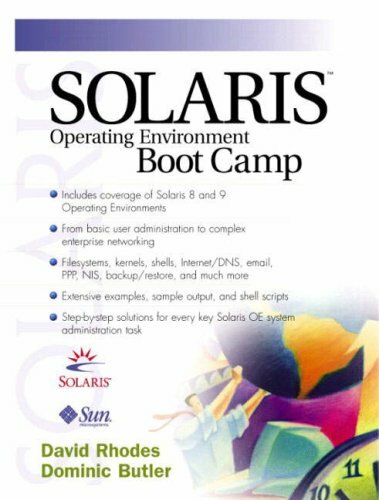 This book covers Solaris 8 and 9 as well as earlier versions. Each chapter starts with a list of relevant manual pages and system files that are related to the tasks described in the chapter. All tasks are explained in detail and illustrated with example commands and the relevant output that system administrators will encounter. Chapters are presented in chronological order and cover the steps that system administrators follow to build systems. For example, Rhodes and Butler start by adding users onto a single system, add the system to the network, move on to configuring services such as NFS and NTP-which rely on the newly-configured network-and so forth until they have built a complex of networked machines using NIS, NTP and a multitude of other services.The code examples in the book have all been built and tested on the systems described in that chapter. Rhodes and Butler also provide a number of tools, which can be used to monitor and manage the system, and define a hierarchy for configuring both the servers and clients. This is the companion to the Solaris System Administrators Reference by Janice Winsor (0130277010)!